It appears that the “eternal flame” is in need of repairs. 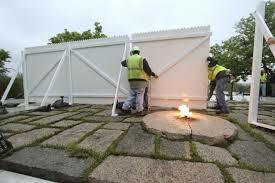 The monument in Arlington National Cemetery dedicated to John F. Kennedy and known as the eternal flame has recently been moved so that repairs can be made to upgrade and enhance the permanent burner system. Not so “eternal” after all, it would seem. Shines on from age to age. Of Christ, the living Word. Still guides, O Christ, to Thee. Your true light, as of old. They see you face to face. ← Is Jesus Christ with us or not?